Ballard was a city of its own until 1907, when the citizenry voted to be annexed into Seattle. This table, like the recent 1895 Seattle Renaming article, shows each original Ballard street name and what it changed to after annexation. A number of original street names continue today, basically anything that isn’t a number. To assemble this table I started with the 1888 Gilman Addition plat from the King County records website, then reviewed the 1905 Sanborn fire insurance maps available online from the Seattle Public Library, and finally I reviewed a 1903 sewer map online (map 1588) at the Seattle Municipal Archives. Street names that did not change are not included. Essentially any named street in Ballard is original. There are a few streets from just outside of the old City of Ballard boundaries, towards Fremont or across the canal. I happened to notice them while reviewing maps and went ahead and listed them. 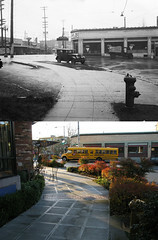 For more information on old Ballard, check out my book Lost Seattle. This data has been shared with a Creative Commons license on Figshare. You can download the full table there. Edit 1/2019: I have not yet incorporated the original Salmon Park addition street names (plat map available at WA Digital Archives). Because there is a significant change from that 1890 plat to the 1903 sewer map I link to above, that will definitely lead to confusion. Oddly, the name Denton for example is still used in the 1903 Ballard directory, but by this 1903 map it is already “Third Avenue North”. The 1904 Ballard directory’s street guide is a helpful way to bridge the gap between the two maps. Again using our Denton example, it says Denton is “third east of Fourth Ave W from Ship to city limits”. On the sewer map that is clearly Third Ave North. In the lookup table below, Third Avenue North comes up as 22nd Ave NW. So Denton became 3rd Ave N, which became 22nd Ave NW. It’s also possible to do a visual comparison between the original plat map and current Google maps. The streets are the same today, so you can get oriented with Salmon Bay Park (“PARK” in the plat) and go from there. McDermott: J. D. McDermott, who Denton purchased part of the property from. Great stuff on here, Rob, thank you. when did w 79th change to ? ?nw 79. Lea, that changed in 1961. Here’s an archived city of Seattle page with details (the page is down at this moment). thank you. I have been trying to find where my 3x great grandfather lived while building boats bound for the Yukon in 1900. I found him in the directory at 330 Times. You have been a great help by showing the new street names!